Senior Program Analyst is responsible for creating secure functional codes and programs for the company, the typical job roles and responsibilities for these Analysts include participating in Information system analysis, collaborating with business analysts and other developers to create software designs, formulating program specifications, transforming software designs into highly functional code using appropriate languages, integrating individual software into complex level systems, using web-based tools to develop advanced Saas, upgrading system and software to make it more secure and efficient and performing debugging wherever applicable. A Senior level Program Analyst should possess capabilities in languages such as C++, XML, Python, J2EE, and Java; they are expected to be proficient in any of the popular web framework like JSF, GWT, Spring MVC or wicket, apart from possessing outstanding experience in SQL or ORM technologies. 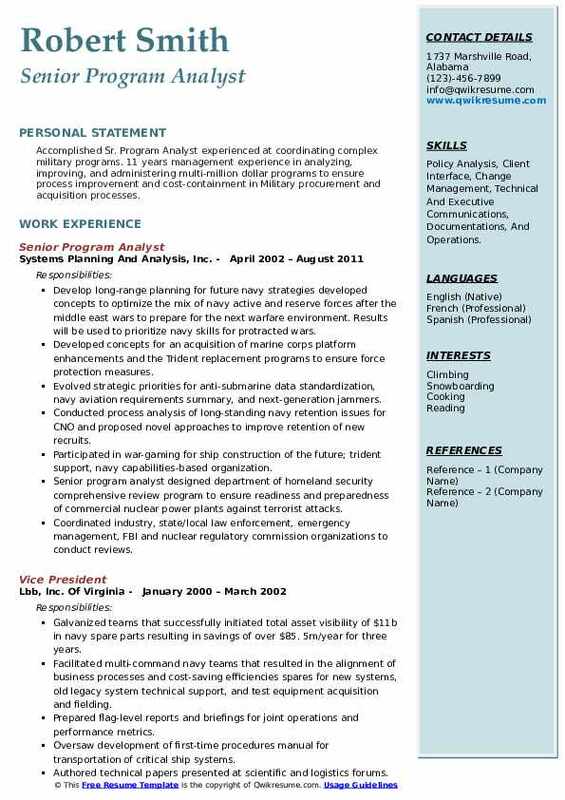 The best Senior Program Analyst Resume highlights a degree in Computer science or IT or its relevant discipline. 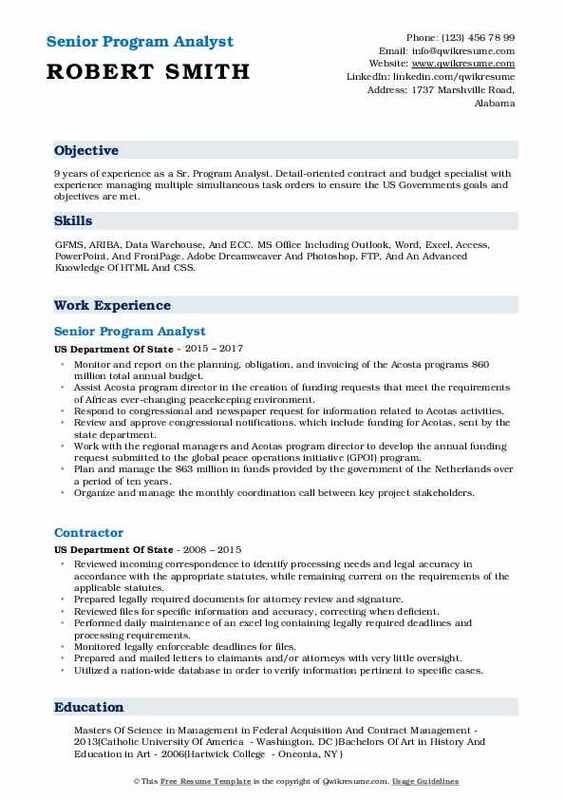 Summary : Dependable professional with over 7 years of government experience as a Sr. 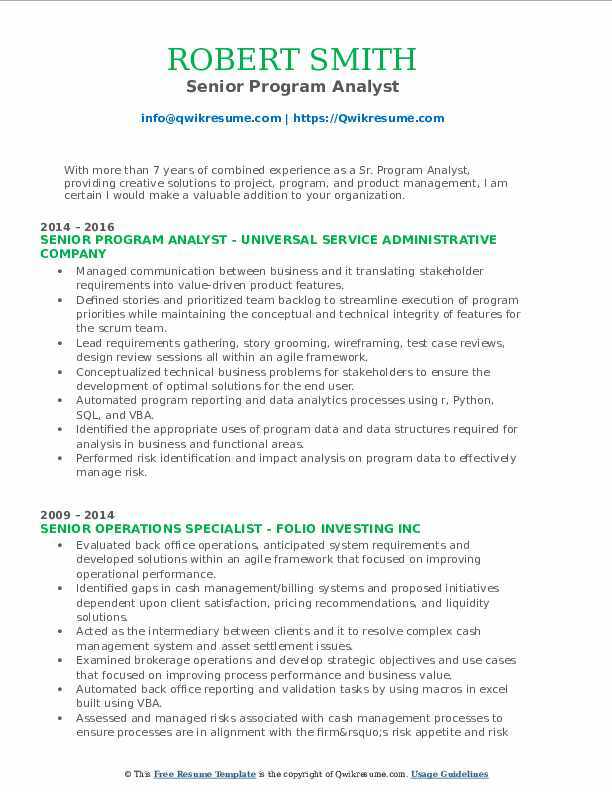 Program Analyst, providing effective and comprehensive analytical, budget and program management, and administrative support to offices, professional staff, and senior officials. Skills : Microsoft Word, Microsoft Excel, Microsoft PowerPoint, Microsoft SharePoint, And Grants Management System. Developed and maintained a collaboration SharePoint site to track and manage over 380 positions and their status, i.e. Occupied, vacant, pending recruitment, incumbent, selected, incumbent pending security clearance, etc. This site enabled hiring managers and senior management officials to view position status within their specific directorate office and quickly and easily run reports for quarterly program briefings. Managed contracting efforts to recruit and hire over 52 third-party contractors through various staff augmentation contract vehicles. This included the development of. Request for proposal documents, i.e. Scopes of work, independent government. Oversaw and ensured that the administrative and security functions of the program office were effectively carried out daily. Creating, implementing, and communicating security requirements to protect classified information while providing day-to-day multi-discipline program security operations support and oversight. Prepared responses to inquiries by the office of the inspector general government accountability office (GAO), and house committee. Summary : 18+ years of experience as a Sr. 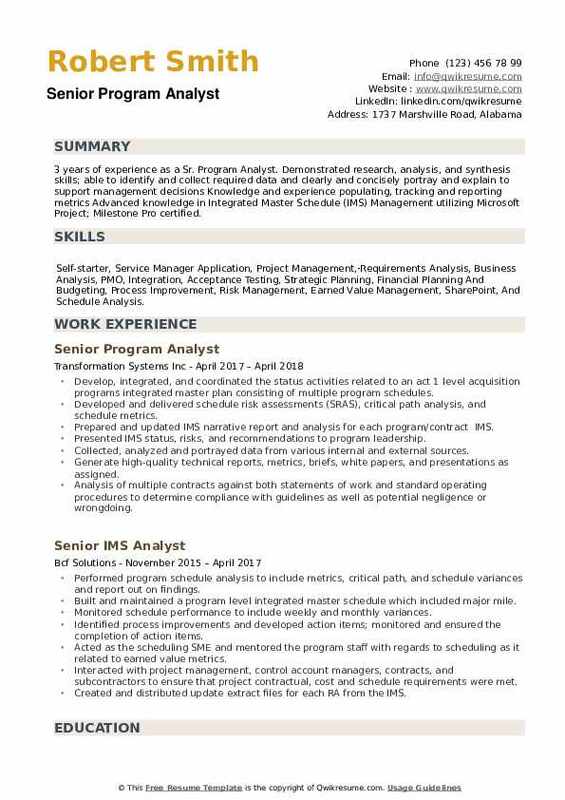 Program Analyst. Served as coach and mentor for first level managers, technicians, and service desk staff on both technical sides of the operations both desktop and service side areas. Skills : Windows7, IE, Microsoft Office Products, Powerpoint, Excel, Typing, Data Analysis, DEAMS, IRMIS, JWICS, And ABIDES. Serving as agency time and labor policy coordinator. Monitor use of time reporting codes to assure accurate billing of time charges to licensees. Maintain a roster of activity descriptions under time reporting codes as a reference for staff to record their time. Oversee bi-weekly time reporting to confirm that charges are applied to the proper licensee and project. Provide requirements to automated systems personnel to improve the accuracy of data. Co-leading the development of the agency strategic plan for the nuclear regulatory commission (NRC). Coordinate with NRC offices and solicit comments from stakeholders on the draft strategic plan. Organize the process for commission approval of the strategic plan and manage the publication process. Leading the development of the annual performance and accountability report (par). Provide extensive project management coordination among various NRC organizations, including the commission. Guiding and assisting program offices as an expert on the government performance and results from modernization act and performance management and measurement for NRC programs. Managing and overseeing biennial reviews of fees for agency activities for which fees are collected as required by the chief financial officers' act to determine if the appropriate fees are being assessed. Summary : 12+ years of experience as a Senior Program Analyst is seeking a position which would allow me to demonstrate my professionalism and versatility as an experienced Program and Budget Analyst capable of working independently and in a team. Overseeing and managing the program objective memorandum (pom), foreign military sales, admin (FMS-a) fund, defense acquisition workforce development funds. Consolidate, formulate, analyze, develop and justify the scheduler (requirements) and justification book of RDTE (R-forms) for the POM and submit to higher headquarters. Developing and preparing briefing charts and brief g-8 leadership, ACC commanding general army. Delegating and managing workload, and provide guidance and support to team members. Developing written guidance and submitted to the activities for information or to take action. Monitoring and tracking all taskers QuickBase to ensure deadlines are met. Reviewing cost-benefit analysis (CBA) to ensure all financial information is correct. Developing and preparing various executive level correspondence to include issue papers. Management decision package briefs and the commanders narrative assessment for senior leadership and for higher headquarters and Department of Army (DA). Summary : 11+ years of experience as a Sr. 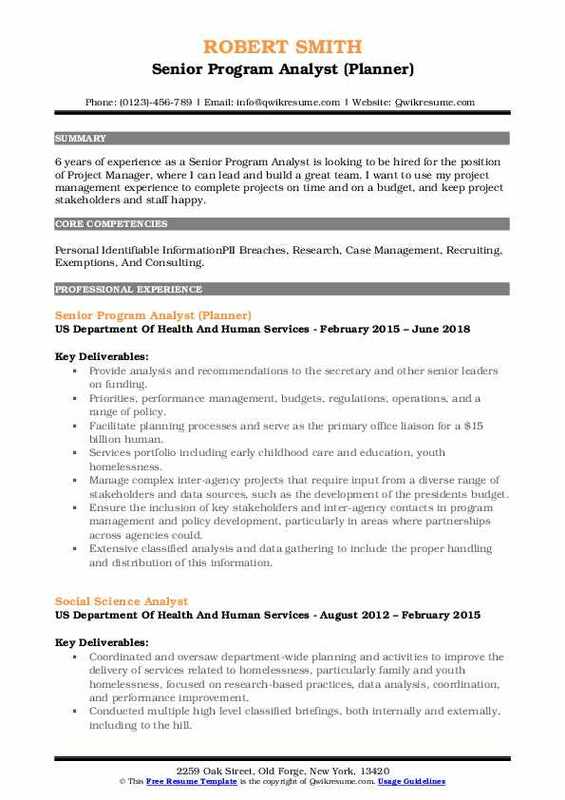 Program Analyst. Dedicated, versatile and focused professional with experience providing acquisition program administrative management, financial, logistics, and configuration support to Department of Defense Commands. Skills : Project Management, Financial Management, Portfolio Management, MCTS Microsoft Certified Technology Specialist In MS Project 2007 & Project Server 2007 From Microsoft, And Six Sigma Certified. Contributing to the development of a comprehensive program statement of work(SOW) by creating a deliverable-oriented program work breakdown structure(WBS) in ms project SAP. Contributing to program risk management and change management plans. Coordinating with business areas, project manager and program leads in the identification, analysis, reporting, and closure of program risks and issues. Coordinating with the marketing product managers to gather and define requirements, prepare document scenarios, documentation of business and functional requirements etc. Negotiating for resources (as required) within the context of the project objectives, requirements, and priorities. Interface with a customer(s) and all other areas/individuals affected by the project. Synthesizing findings from financial analysis and make verbal/written recommendations to upper management. Facilitate workout problem-solving sessions with functional leaders across the organization. Executing monthly analyses of cost and schedule performance and variation from the plan based on earned value, including estimate at completion (EAC). Support PMO budgeting/ financial planning effort. Summary : Accomplished Sr. 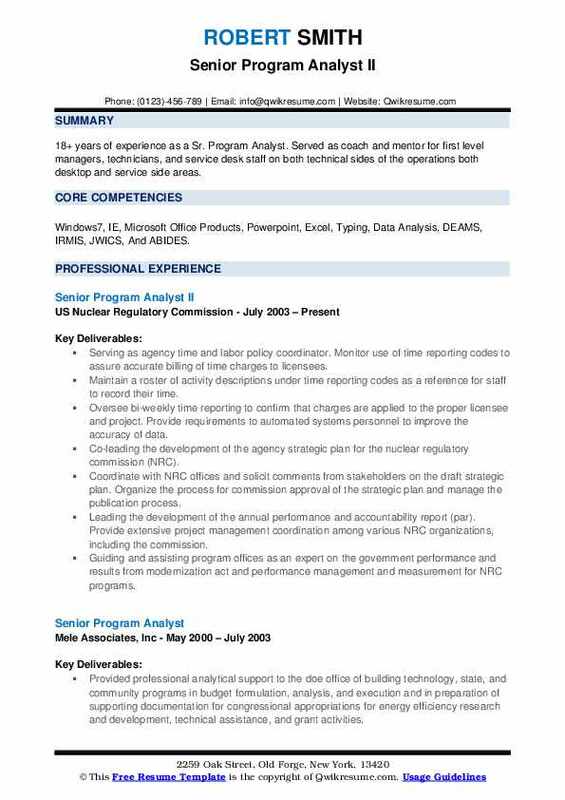 Program Analyst experienced at coordinating complex military programs. 11 years management experience in analyzing, improving, and administering multi-million dollar programs to ensure process improvement and cost-containment in Military procurement and acquisition processes. Skills : Policy Analysis, Client Interface, Change Management, Technical And Executive Communications, Documentations, And Operations. Develop long-range planning for future navy strategies: developed concepts to optimize the mix of navy active and reserve forces after the middle east wars to prepare for the next warfare environment. Results will be used to prioritize navy skills for protracted wars. Developed concepts for an acquisition of marine corps platform enhancements and the Trident replacement programs to ensure force protection measures. Evolved strategic priorities for anti-submarine data standardization, navy aviation requirements summary, and next-generation jammers. Conducted process analysis of long-standing navy retention issues for CNO and proposed novel approaches to improve retention of new recruits. Participated in war-gaming for ship construction of the future; trident support, navy capabilities-based organization. Senior program analyst: designed department of homeland security comprehensive review program to ensure readiness and preparedness of commercial nuclear power plants against terrorist attacks. Coordinated industry, state/local law enforcement, emergency management, FBI and nuclear regulatory commission organizations to conduct reviews. Analyzed "best practices" summary of security and emergency service capabilities that are currently being incorporated as nuclear regulatory commission new regulations. Summary : 9 years of experience as a Sr. 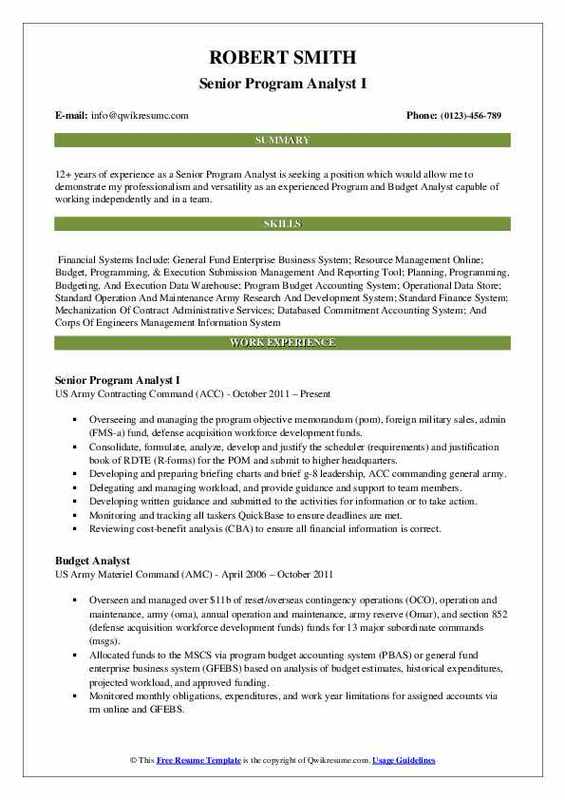 Program Analyst. Detail-oriented contract and budget specialist with experience managing multiple simultaneous task orders to ensure the US Governments goals and objectives are met. Skills : GFMS, ARIBA, Data Warehouse, And ECC. MS Office Including Outlook, Word, Excel, Access, PowerPoint, And FrontPage. Adobe Dreamweaver And Photoshop, FTP, And An Advanced Knowledge Of HTML And CSS. Monitor and report on the planning, obligation, and invoicing of the Acosta programs $60 million total annual budget. Assist Acosta program director in the creation of funding requests that meet the requirements of Africa's ever-changing peacekeeping environment. Respond to congressional and newspaper request for information related to Acotas activities. Review and approve congressional notifications, which include funding for Acotas, sent by the state department. Work with the regional managers and Acotas program director to develop the annual funding request submitted to the global peace operations initiative (GPOI) program. Plan and manage the $63 million in funds provided by the government of the Netherlands over a period of ten years. Organize and manage the monthly coordination call between key project stakeholders. Draft the annual report documenting how project funds were obligated and liquidated. Summary : With more than 7 years of combined experience as a Sr. Program Analyst, providing creative solutions to project, program, and product management, I am certain I would make a valuable addition to your organization. Skills : Programming, Project Management, Process Improvement, Finance, Product Owner, RStudio, Python, Business Intelligence, SQL, JIRA, And Confluence. Managed communication between business and it translating stakeholder requirements into value-driven product features. Defined stories and prioritized team backlog to streamline execution of program priorities while maintaining the conceptual and technical integrity of features for the scrum team. Lead requirements gathering, story grooming, wireframing, test case reviews, design review sessions all within an agile framework. Conceptualized technical business problems for stakeholders to ensure the development of optimal solutions for the end user. Automated program reporting and data analytics processes using r, Python, SQL, and VBA. Identified the appropriate uses of program data and data structures required for analysis in business and functional areas. Performed risk identification and impact analysis on program data to effectively manage risk. Supported senior management in program strategy planning to link product development with program outcomes. 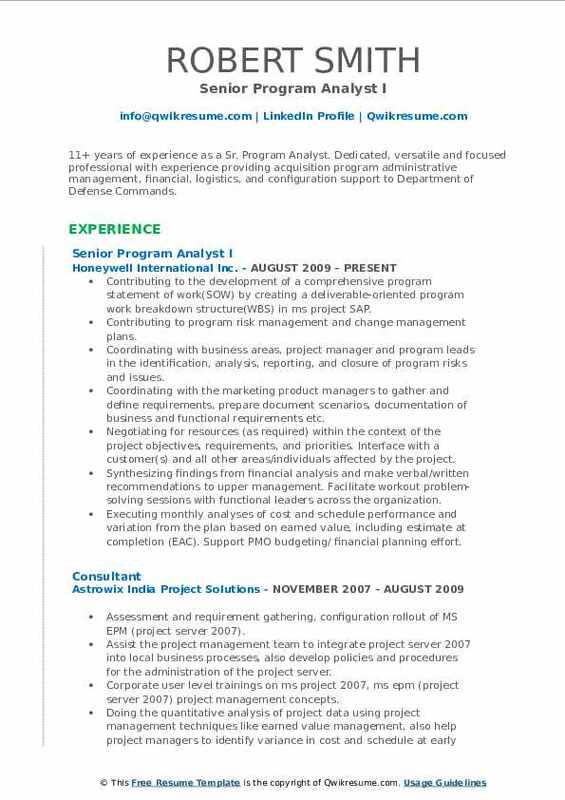 Headline : 6 years of experience as a Senior Program Analyst is looking to be hired for the position of Project Manager, where I can lead and build a great team. I want to use my project management experience to complete projects on time and on a budget, and keep project stakeholders and staff happy. Skills : Personal Identifiable InformationPII Breaches, Research, Case Management, Recruiting, Exemptions, And Consulting. Provide analysis and recommendations to the secretary and other senior leaders on funding. Priorities, performance management, budgets, regulations, operations, and a range of policy. Facilitate planning processes and serve as the primary office liaison for a $15 billion human. Services portfolio including early childhood care and education, youth homelessness. Manage complex inter-agency projects that require input from a diverse range of stakeholders and data sources, such as the development of the presidents budget. Ensure the inclusion of key stakeholders and inter-agency contacts in program management and policy development, particularly in areas where partnerships across agencies could. Extensive classified analysis and data gathering to include the proper handling and distribution of this information. Summary : Over 8+ years of progressive experience as a Sr. Program Analyst, in Product management, Solution analysis and technical development Domain expertise in Health Insurance and Supply chain Experience delivering solutions in both start-up and enterprise environments. Skills : CSS, HTML, LINUX, MYSQL, PHP, HP Quality Center (ALM), Remedy, Bugzilla Web Design: PHP, CSS, HTML, DHTML, Dreamweaver Database: MySQL, ORACLE Requirements: AxurePro, BizApp, Project In Vision (PIV), Visio, and Balsamiq. Product lead and SMEs for multiple applications including care management and pharmacy benefit management, claims processing - mobile app, and live chat. Leading a team of business analysts in requirements gathering while providing sound technical solutions. Working closely with the product management team in tracking and prioritizing product enhancements and defects. Managing project/portfolio communications across multiple departments including but not limited to technology, business, executive team, and PMO. Working with the PMO and stakeholders for the mitigation of risk while delivering simultaneous projects. Presenting business initiatives to stakeholders and document business solutions and workflows. Performing UAT/product acceptance after a release into production. Managing clients meetings for UAT validations. 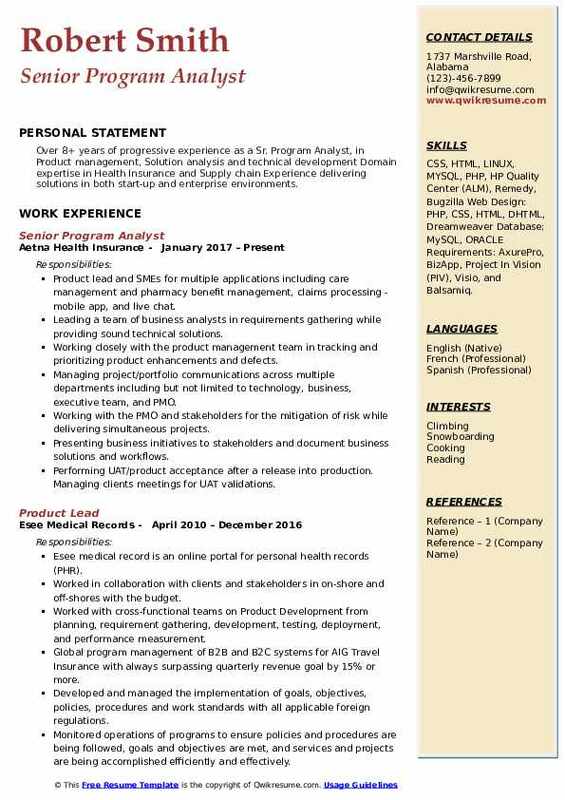 Objective : 3 years of experience as a Sr. 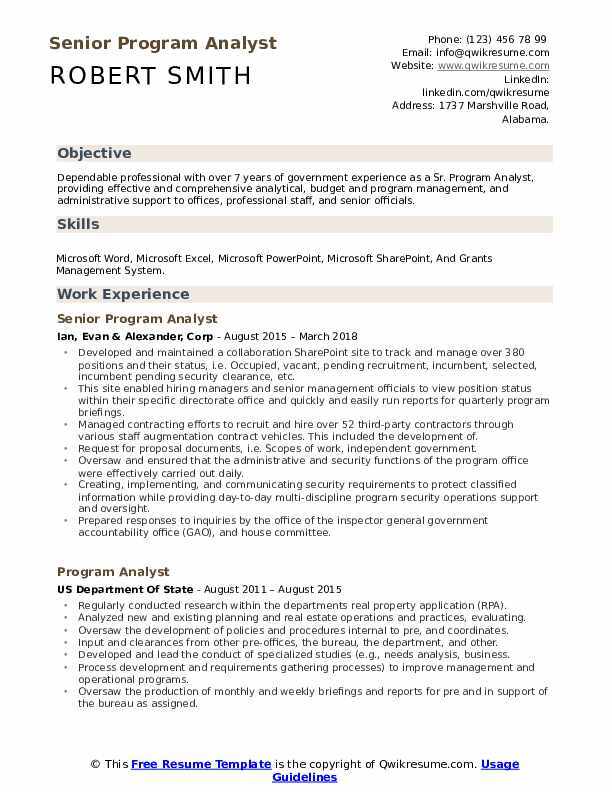 Program Analyst. Demonstrated research, analysis, and synthesis skills; able to identify and collect required data and clearly and concisely portray and explain to support management decisions Knowledge and experience populating, tracking and reporting metrics Advanced knowledge in Integrated Master Schedule (IMS) Management utilizing Microsoft Project; Milestone Pro certified. Skills : Self-starter, Service Manager Application, Project Management, Requirements Analysis, Business Analysis, PMO, Integration, Acceptance Testing, Strategic Planning, Financial Planning And Budgeting, Process Improvement, Risk Management, Earned Value Management, SharePoint, And Schedule Analysis. Develop, integrated, and coordinated the status activities related to an act 1 level acquisition programs integrated master plan consisting of multiple program schedules. Developed and delivered schedule risk assessments (SRAS), critical path analysis, and schedule metrics. Prepared and updated IMS narrative report and analysis for each program/contract IMS. Presented IMS status, risks, and recommendations to program leadership. Collected, analyzed and portrayed data from various internal and external sources. Generate high-quality technical reports, metrics, briefs, white papers, and presentations as assigned. Analysis of multiple contracts against both statements of work and standard operating procedures to determine compliance with guidelines as well as potential negligence or wrongdoing. Traveled extensively throughout the theater to meet with various military elements affected by the threat of IEDs, including route clearance teams, to discuss their tactics, techniques, and procedures.